Every once in a while, the Lords that rule over our lands set aside their differences, they ask their men at arms to lay down their weapons and reflect. This reflection is typically marked by a period of relative peace. Minor scuffles still do occur, but for the large part, they are quickly stamped out by the leadership of their respective Orders. Recently, we entered into one of these coveted periods of time, when warriors can enjoy much-needed rest and armies can return home to their loved ones. The cause of this tremendous calming can be attributed to the global event recently launched, known simply as the "Develop Science" challenge. All rulers of their towns were expected to take part and would be rewarded handsomely for doing so. Vast riches would be showered onto those lords who could best advance the technologies of their towns and thus the development of the realm as a whole. It is during these time periods in which great advancements in military and economic technologies are made. As we have seen in the past, progress comes rapidly and towns flourish, especially since most are focused on advancing their knowledge base, rather than killing one another. A rare event indeed. 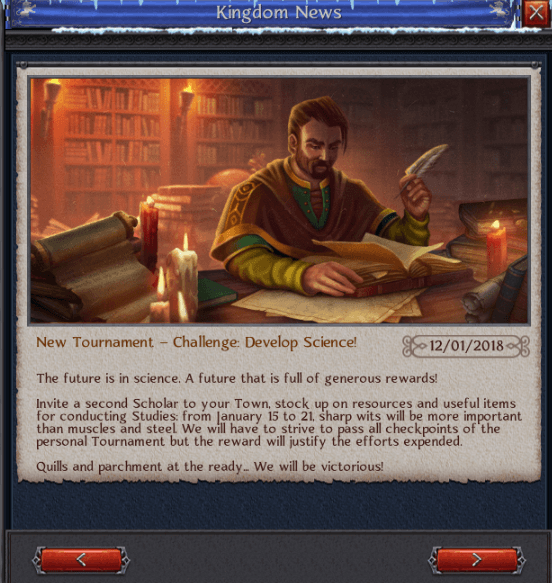 Scholars were working overtime and some towns even hired on additional help via the bonus activation, in which two scholars can be assigned to learning knowledge rather than the typical one. For those with these bonuses in reserve, or for those with the gold to purchase this upgrade, they saw an immediate increase in efficiency and thus were granted points at a much faster rate. Some of these lords, such as Siegfried, Gimmbartiger, and Goldi were prime examples of those taking advantage of the bonuses offered to them, pulling far ahead in the early days of the event. Still, many days remained, and much more knowledge was yet to be discovered. Candles burned late into the night as Scholars continued to pore over ancient texts and experiments of exotic nature were conducted. In the end, there could only be a handful of winners from each bracket. 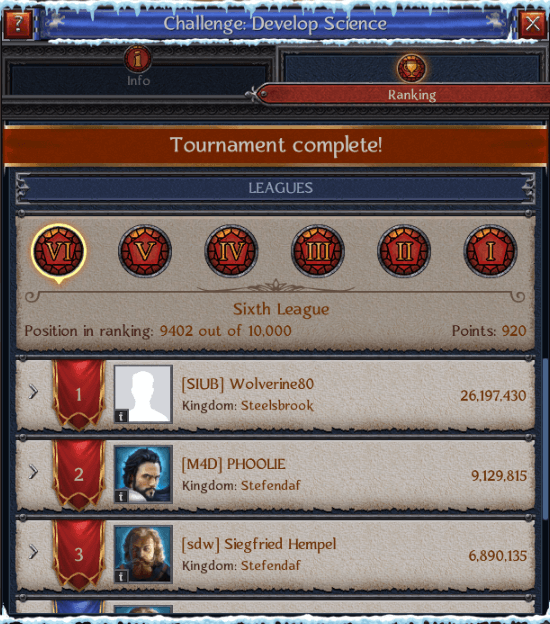 Siegfried, who had an early lead in the event, managed to remain in the top three positions, while Wolverine and Phoolie pulled strongly ahead, taking the first and second ranks respectively. Yet, even though there were a few clear winners, the realm as a whole benefited from this cause: progress was rapidly advanced, new skills were learned and the production of resources increased tremendously. Now, the peace is over and once again the rumblings of war are rising on the horizon. 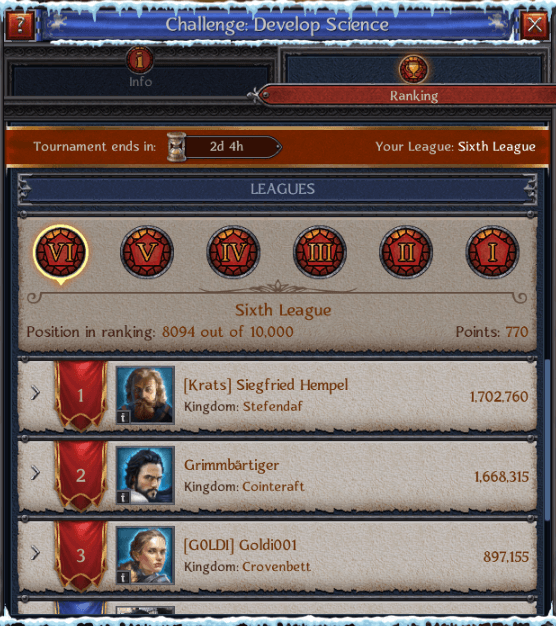 Lords will be looking to use those advantages they gained during this period of learning to gain the upper hand over their rivals and utterly crush their enemies. Some things never change.